Since 1973, when President Ford established the week to recognize Emergency Medical Services and its workers, communities around the United States have paused to thank those in the community that do so much to keep them healthy and strong. Richland County is no exception, having often proclaimed National Emergency Medical Services Week a week to both celebrate the dedication of this select group of residents and foster conversations regarding health and safety of residents. Across the country, as EMS faces challenges such as community para-medicine and frequent changes in protocols, EMTs have proven persistent and resilient. Each community is made up of different people going through different struggles. EMTs are some of these people. They are neighbors and friends. They are students praying to survive Finals week. They are parents hoping their kids don’t catch that flu going around at daycare. They are co-workers trying to make deadlines. They are other drivers on the road, other shoppers at the store, other faces on the street. They are human, which means they understand. EMTs have been there. They have watched family members struggle and have struggled themselves with illness or injury. So when their pager goes off, they know the need. Thanks to hours of classes and experiences, they often know the answer. One of their goals in EMS Week is to raise awareness of the common reasons they are called and how you can reduce your risk. For almost every EMS service, the number one dispatch reason is a fall, which in many cases can be addressed by wearing non-slip shoes and removing rugs or mats that may trip you. Regarding car accidents, never drive distracted, come to a complete stop at stop signs, and check for pedestrians, bicyclists, and motorcyclists. As always, eat healthy and exercise regularly. Try to keep a list of current medications in your wallet or purse as well as information on any allergies or medical conditions that may be important for EMTs to know in the case that you are unable to communicate. Get to know your neighbors and have someone you can call if you just need a hand up or need someone to keep an eye on the house. And if you feel you or someone you love may need an ambulance, just dial 9-1-1. Don’t be surprised if you recognize a few faces when they come to help you onto the road to recovery. Whether it’s the team at Grady EMS in Atlanta who had the expertise to transport the nation’s first Ebola patient, the volunteer firefighters and flight medics called to search for and rescue survivors in the Everett, Wash. mudslide or the thousands of EMS responses that happen 24 hours a day, 7 days a week and don’t make the news, EMS is there for their communities at their greatest time of need. 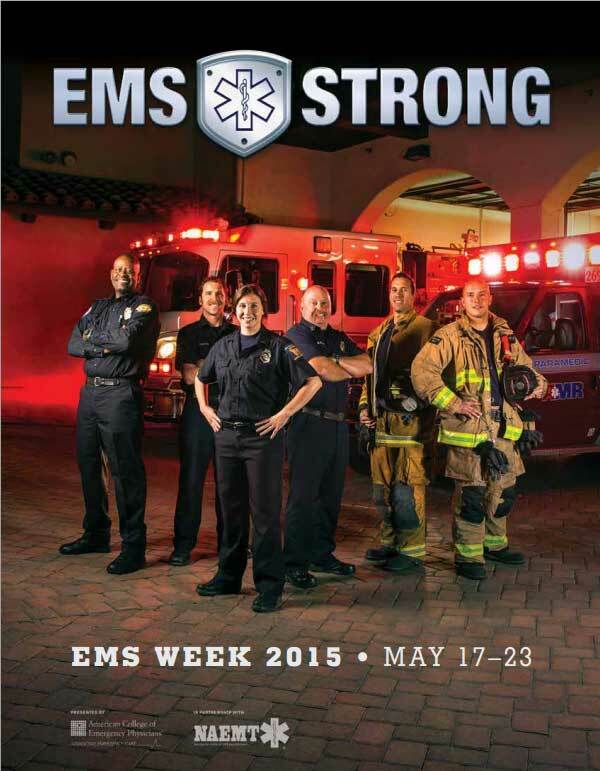 This year, NAEMT is pleased to announce a new partnership with the American College of Emergency Physicians on a national EMS Week promotional campaign, known as EMS Strong. By joining forces with ACEP, NAEMT will continue to work toward ensuring that the important contributions of EMS practitioners in safeguarding the health, safety and well-being of their communities are fully celebrated and recognized. That has never been more important, given the changes in healthcare that are occurring as part of healthcare reform. With the nation seeking ways to control healthcare costs while improving the health of patients, and the way in which medical care is paid for shifting from a system that rewards the volume of services provided to one that rewards high quality, effective care, EMS is proving that it is dedicated to solving the nation’s healthcare challenges through innovations such as Mobile Integrated Healthcare and Community Paramedicine. As the role of EMS continues to evolve, there is no better moment to celebrate how far EMS has come, to remind communities about the vital work of EMS practitioners, and to lay plans for where EMS wants to go in the future. Whether celebrated with a company cookout or a catered lunch; an open house, an awards ceremony or even quiet reflection about what it means to be an EMS practitioner, EMS Week is the perfect time to recognize EMS and all that its practitioners do for our nation. Richland County Ambulance Service is currently seeking qualified candidates for the position of Advanced EMT/Intermediate Technician. Qualified persons must be 21 years old, have a valid Wisconsin driver’s license and a current Wisconsin AEMT or Intermediate Technician license. Candidates considered for employment must pass a criminal background check and drug screen. Qualified applicants will be asked to participate in a series of written and cognitive skills testing, related to the position, prior to employment. 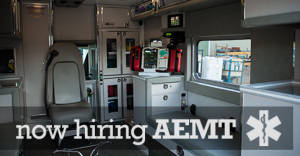 Richland County Ambulance Service is an equal opportunity employer and offers a complete benefit package and competitive wage starting at $10.92 per hour with an increase to $11.42 after the probation period. Applications and job description can be obtained below or at the Richland County Clerk’s Office located on the third floor of the Richland County Courthouse at 181 W Seminary St., Richland Center, WI 53581. Completed applications must be accompanied with a resume and cover letter and returned to the Richland County Ambulance Office, located on the first floor of the Richland County Courthouse 181 W Seminary St., PO Box 251, Richland Center WI 53581. Applications will be accepted until all positions are filled. 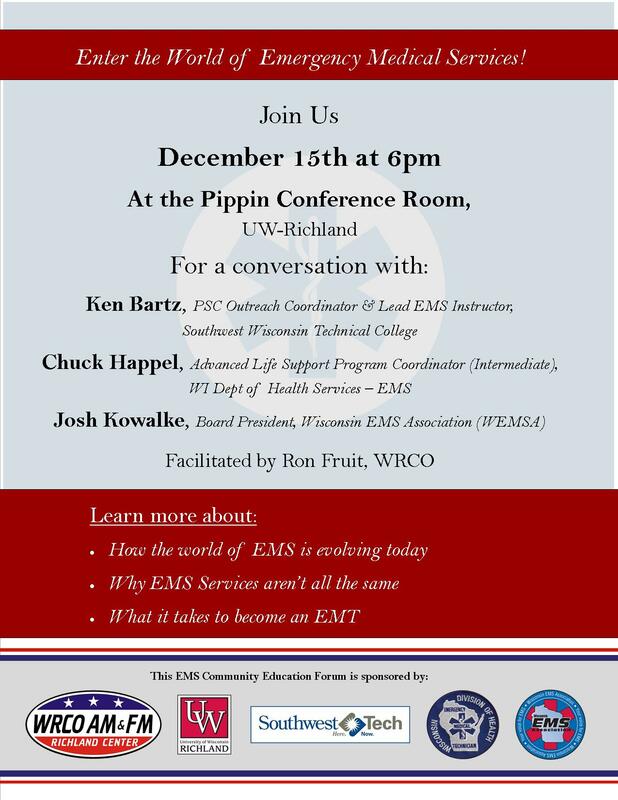 Join WRCO and UW-Richland in welcoming guest panelists Ken Bartz, Chuck Happel, and Josh Kowalke for a conversation about emergency medical services. This Community Education Forum will be held in the Pippin Center at UW-Richland on Monday, December 15, at 6pm. The panelists will discuss how EMS has changed in Wisconsin since it got its official start in 1968 and what it takes to work in the field. 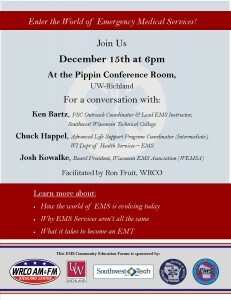 Each of the panelists brings with them a unique perspective and knowledge of Wisconsin EMS. Ken Bartz is the lead instructor of EMS at Southwest Wisconsin Technical College, training students across the region on emergency medical care. Chuck Happel is the Wisconsin Department of Health Services EMS Program Coordinator for Advanced Life-Support, working with intermediate-level ambulance squads to grant licensure and ensure compliance. Josh Kowalke is the Board President for the Wisconsin EMS Association, helping to strengthen the emergency care provided in Wisconsin though education, information, and legislative action. 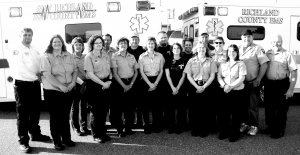 The goal of this event is help the Richland Center community better understand emergency medical services from a grander perspective and answer any questions that may exist. While there have been many discussions recently regarding EMS in the area, this event will focus on EMS at the regional and state level. Potential topics include the differences in education and care from first responder to paramedic and how the introduction of career positions has impacted the original volunteer ambulance model in rural areas. This community education forum is made possible through partnerships with WRCO, UW-Richland, Southwest Wisconsin Technical College, Wisconsin Department of Health Services – EMS, and the Wisconsin EMS Association. For more information, please contact Ron Fruit at rfruit@wrco.com. Back on August 19th, a group of seven Richland Center residents met in Readstown to begin an 18-week journey that would test their courage, perseverance, patience, and dedication. Sponsored by the Richland County Ambulance made possible by special training grants, this year’s group of EMT Trainees includes Richard Brown, Amber Burch, Julie Hendricks, Dolan Hostetler, Cody Layer, Katie Spry, and Connie Studnicka. Now halfway through the course to become Emergency Medical Technician – Basics, these students reflect on what they’ve learned and recognize the amount of work left on the road to an EMT license. Take the challenge, donate and help us create a world without ALS! Experience the #IceBucketChallenge phenomenon that’s spreading ALS Awareness across the country. Derek Goplen of Richland Center EMS took the #IceBucketChallenge and challenges everyone to donate to ALS or another charity of your choice. The members of the Richland County Ambulance Service would like to thank all the students, parents and teachers that participated in the coloring contest in honor of National EMS Week. As a token of our appreciation we will be handing out “Dedicated for Life” bracelets to all the children that participated in the contest. The bracelets will be delivered to teacher’s of each class that participated for disbursement. We would also like to thank our Honorary Judges; Sheila McCauley, Loren Abraham, Connie Studnicka, and Lori Post. Loren and Sheila were long time EMT’s of our squad. Lori is a current member and Connie is new to our service as a trainee. 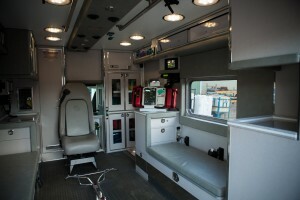 The Richland County Ambulance Service would like to thank everyone that was able to attend the Open House for EMS Week. 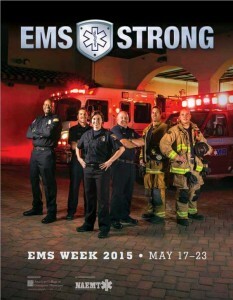 EMS Week officially started Sunday, May 18th. 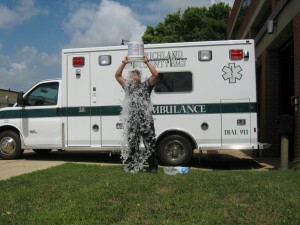 Read more about National EMS Week here… https://ems.co.richland.wi.us/national-ems-week-2014/. 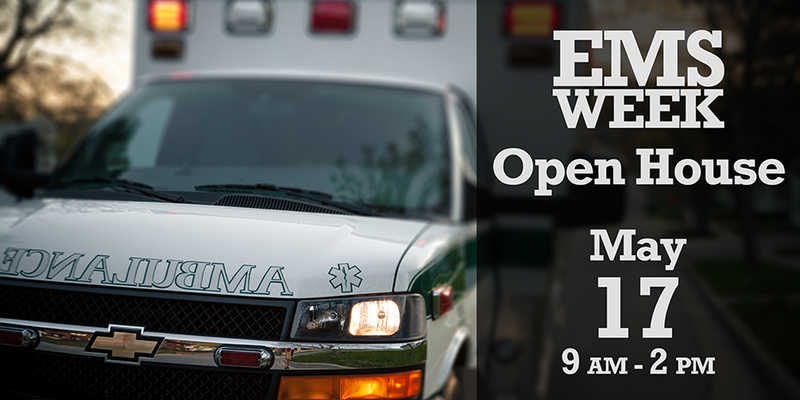 Richland County EMS is hosting an Open House – Click here for details!